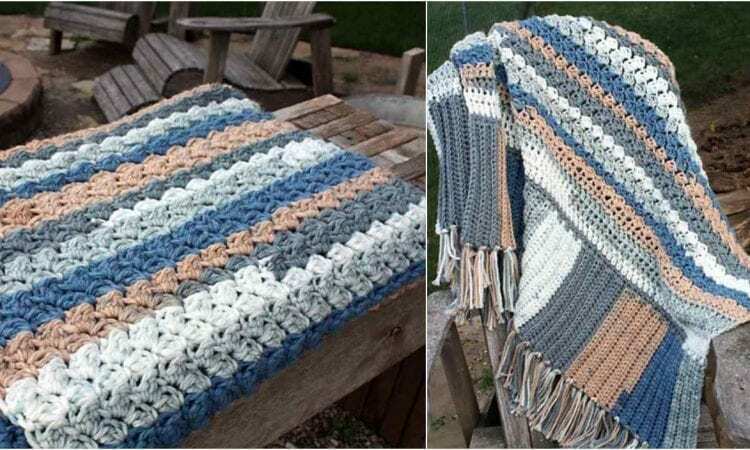 This is a beautiful idea for a substantial blanket making use of Bernat Softee Chunks yarn. The idea is that while it’s similar in feel to Caron Tea Cakes, it’s definitely better fo the beach or cottage because it’s synthetic, and fears no water. It’s chunky and soft, and as a result the blanket is luxuriously squishy, while at the same time being light and airy. Since cottage and beach season is approaching fast (although, given the amount of snow outside of my window, one can doubt that) isn’t it time to get going with appropriate projects? A link the free pattern is at the end of the post. like it will try to make some time, right now I am trying to make a cocoon for a baby in a form of a start, which is a little hard but I am trying to make it.